UDOT counts homes that are not even behind the wall intended to protect the residential area to falsely claim they meet the required cost criteria. UDOT admits it. The Governor’s office says there is nothing they can do about it. The residential portion of the wall is intended to protect the residential area. 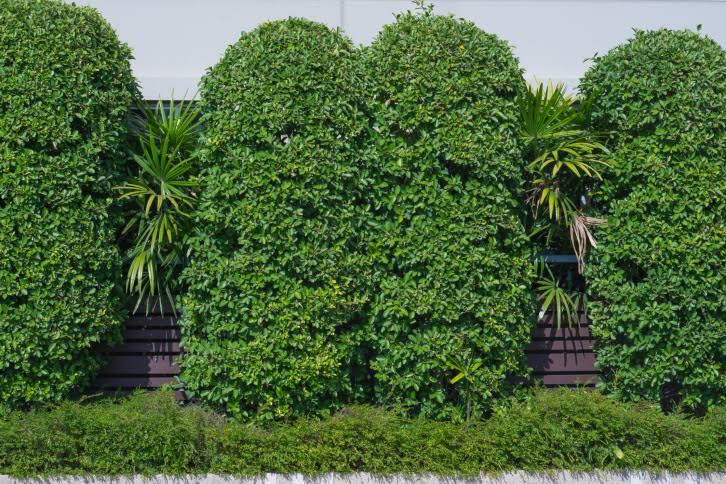 The cost of the residential wall is based on the length of the wall and the number of benefited receptors protected by it, and of course those numbers have to match. How did UDOT arrive at the length of 1600 feet for the residential wall? They just made it up. There is nothing in their Noise Policy to substantiate or justify that length. 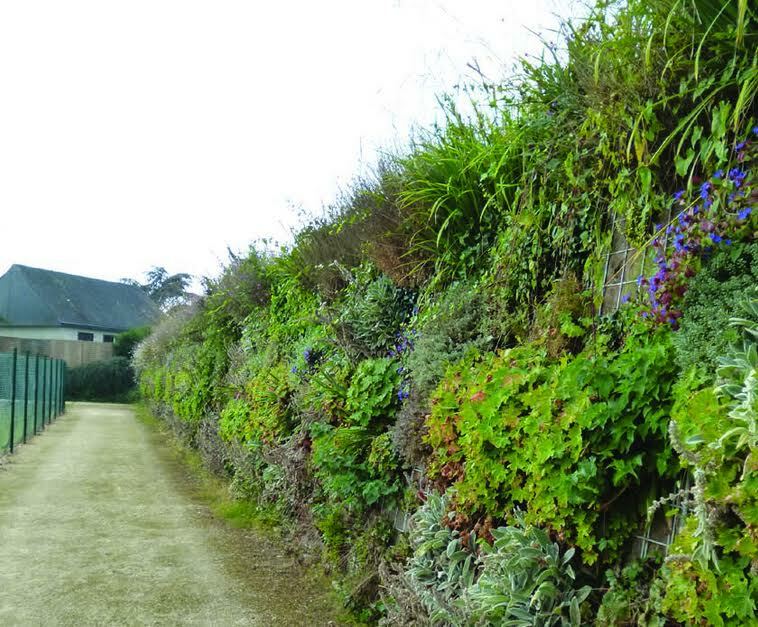 How did they arrive at 24 benefited receptors would be protected by the 1600 feet residential wall? They just made it up. There is nothing in their Noise Policy that substantiates or justifies that position. It is a violation of the Utah Noise Policy and the Utah Administrative Code (Utah state law) to arbitrarily shorten the length of the residential portion of the wall to falsely claim it meets the cost reasonableness criteria. There are also other actions by UDOT in which they are violating the Utah Noise Policy. Also recent examination of data shows that UDOT failed to include and demonstrate the noise reduction benefits of the planned re-paving of I-80. This is important because it is not only the 1dBA noise increase from the climbing lane that triggered the noise study, but also because there are already homes above the UDOT Noise Abatement Criteria (NAC) of 66dBA. This is important because there are other ways to solve the problem. CATW has reviewed research that shows new high density asphalt can reduce highway noise by as much as 8dBA, which out performs the berm/wall. UDOT says they cannot use that asphalt, but they will use the best asphalt available on the market. 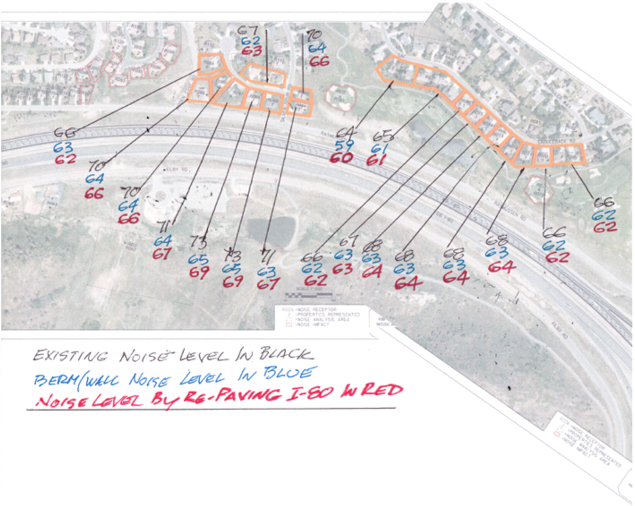 If the asphalt used by UDOT were to merely reduce the highway noise level by 4dBA, it would eliminate 17 homes from being above the UDOT Noise Abatement Criteria (NAC) of 65dBA and would eliminate the need for the noise barrier for a distance of 2373 feet, from the Jeremy Ranch on ramp to Silver Spur Road. There would still be 7 homes in the Silver Spur area that would be at or above the NAC level of 66dBA (3 at, 2 by 1dBA, and 2 by 3dBA). 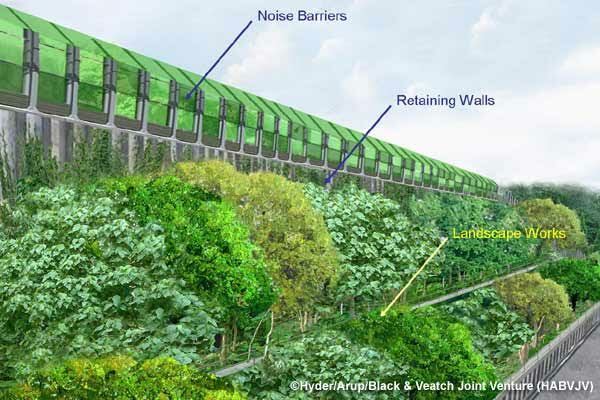 Those 7 homes could achieve a greater noise level reduction by building landscaped noise walls stretching across their own properties, as proposed by several architects who have reviewed the situation. See Table and Diagram shown below. They would get the noise reduction they need. The community would not be burdened with an unsightly barrier that would mar the view shed and open space of the entire neighborhood and west entry into Summit County. 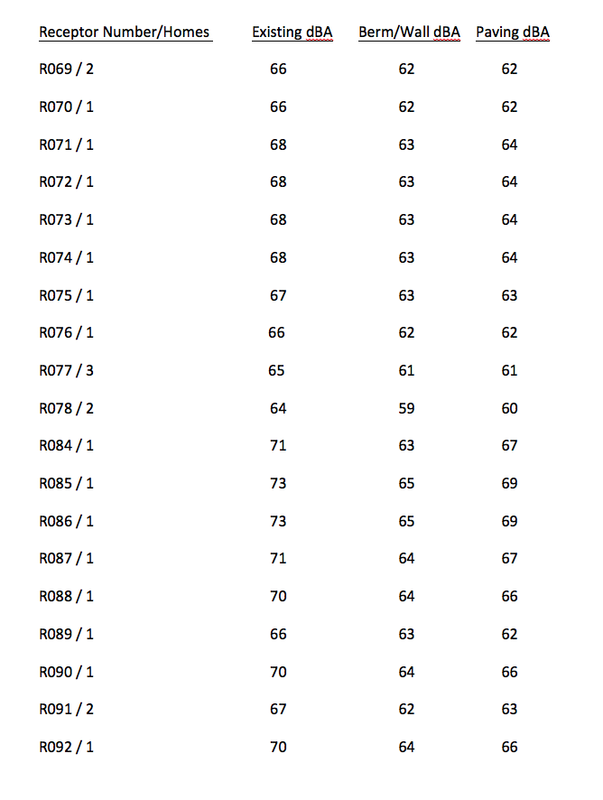 All Saddleback homes, R069 to R078, are below NAC level of 66dBA after paving. Three Silver Spur home, R089 and R091, are below NAC level of 66dBa after paving. Seven remaining homes in Silver Spur area are at or above 66dBA (3 at, 2 by 1dBA, 2 by 3dBA).